I could write about the recent struggles of Rhys Hoskins. The man who looked unstoppable to begin the season has come down to earth quite a bit, and there’s a lot that I could unpack there. But I won’t. Because as much as Hoskins carried the team to begin the season, the team hasn’t missed a beat as his presence in the lineup all but disappeared. You’d think a team’s best hitter going through a prolonged slump would seriously hurt that team’s record, but….it hasn’t. The Phillies are 13-10 during the Hoskins slump. That’s only two Hector Neris meltdowns away from having a better record than while Hoskins was the best hitter in baseball (don’t @ me). Drilling down, the Phillies scored 4.875 Runs/Game pre-slump and are scoring 4.217 Runs/Game during the slump. The pre-slump number is skewed by the 20-run game – outside of that game, the Phillies scored….4.217 Runs/Game. More numbers – The Phillies OBP is about the same over these two timeframes (.325 vs. .324), and their OPS and wRC+ have actually been BETTER during the slump (.697 vs. .744, 92 vs. 104). Repeat after me – the Phillies have been fine without Hoskins. 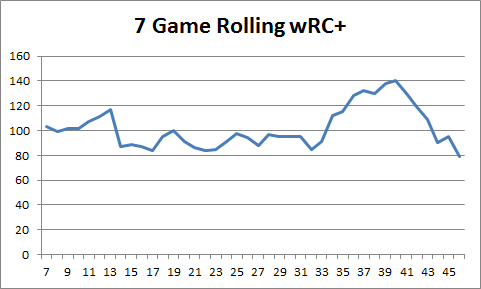 This graph shows how the offense has been over a rolling 7-game window (So games 1-7, 2-8, 3-9, etc.). There have been some ups, but little downs. The worst the Phillies offense has been over a 7-game span is 21% below average. “21% below average sounds bad,” you might be thinking. You’re not wrong – it does sound bad. But it’s the best mark in baseball. As Hoskins dropped off, Santana and others picked up the slack. Even at their worst, the bats have never been truly awful. The Phillies have had the most consistent offense in baseball, and when Rhys starts to heat up again, they will become the team to beat. Standout Hitter: Carlos Santana. The slow starter had himself a great-but-not-flashy week – 24.1% walk rate, 10.3% K-rate, with a homer and five singles. Often when I write about the “best hitter of the week”, it ends up being the player who has the week’s best BABIP – a week isn’t a particularly large sample, so it’d be easy for a few extra hits to tilt the scales in a player’s favor. This isn’t the case with Santana – a .278 BABIP is in line with his career average. He was just hard to get out thanks to his excellent plate discipline. Standout Pitcher: Seranthony Dominguez. The young reliever has quickly become one of the more trusted arms in the bullpen, and with good reason. Over the past week he pitched 5 innings in 4 games and allowed 0 runs, 0 walks, and only 1 hit to the 16 batters he faced. With Pat Neshek still on the shelf and Tommy Hunter struggling, it’s good to have a player come up that can reliably get outs. Sit-Down Hitter: Rhys Hoskins. Hoskins’s struggles stretch beyond the past week, but recently have hit a new low (or should I say “not hit”?). Part of this is his BABIP. Part of it is, well, he seems to be feeling the pressure. Take note of how much yellow/red there is outside the zone in May. His struggles won’t last forever, he’s too talented for that. We just need to wait this out. I hope his bat is better than his glove. Rain delay antics never get old. M. Night Shyamalan presents – Marwin Gonzalez swinging. Twist ending! Reminder than Mike Trout is still the best at baseball. On Sunday, Ronald Acuna suffered a knee injury (which I do not recommend looking up) which looked pretty devastating. Luckily for baseball, it looks like it’s a fairly mild strain, not season ending. Baseball needs its stars. GERRIT COLE EATS BOOGERS. AAAAHHHHHH. < Previous Week 7: Was Carlos Santana Walking Too Much?